Data breach affects 1 in 5 small businesses. As cyber thieves look for easier and more convenient targets, they are looking at smaller enterprises to unleash their attacks on. Protecting your businesses' sensitive customer, employee and vendor data from attack is a priority. This comprehensive white paper on data breach provides a quick education on the risks as well as what solutions exist to mitigate data breach risk for your business. With an average cost estimated to be at $200+ per record breach, an incident can cost a business $1000's in loses due to compliant responses, forensic investigations, potential litigation by those breached, public relations damage control and a slew of additional costs that can seriously impair a business's ability to continue operating. 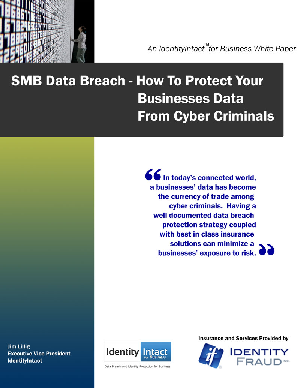 Download the "SMB Data Breach - How To Protect Your Businesses Data From Cyber Criminals" white paper and give your business a fighting chance against the data breach epidemic. 95% of all data breach attacks can be avoided through employee education and proper protocols. Data breach is not a matter of "if", it is a matter of "when". Will your business be prepared when it happens to you?